In conceptualizing and exploring the city we rely a range of smaller areas—neighbourhoods, boroughs, wards and districts—in order to make urban space intelligible. While we can readily discuss how neighbourhoods are shaped by physical geography (topography, adjacency to lakes or rivers, etc. ), ordinance (zoning, access to public transit) and economics (real estate prices, average resident income), machine learning does not really spring to mind when we are considering how we might define ‘a neighbourhood’. 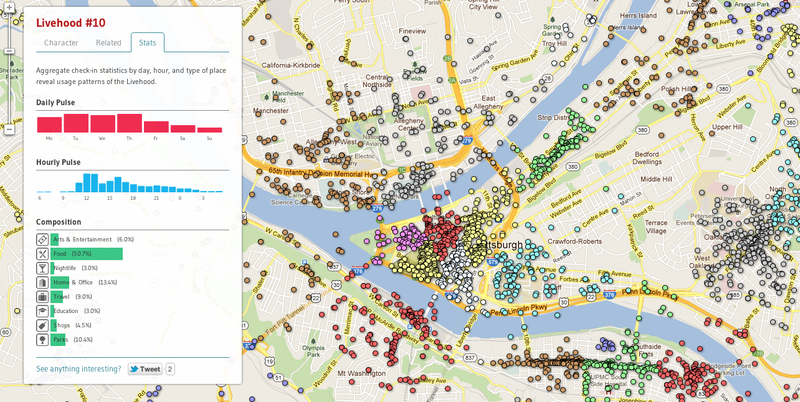 Livehoods is a new project hatched within the School of Computer Science at Carnegie Mellon University that leverages 18 million Foursquare check-ins to draft up new urban ‘activity zones’ based on the patterns of frequent visitors. The venture essentially askshow does a location-based service reflect our sense of place within the city? 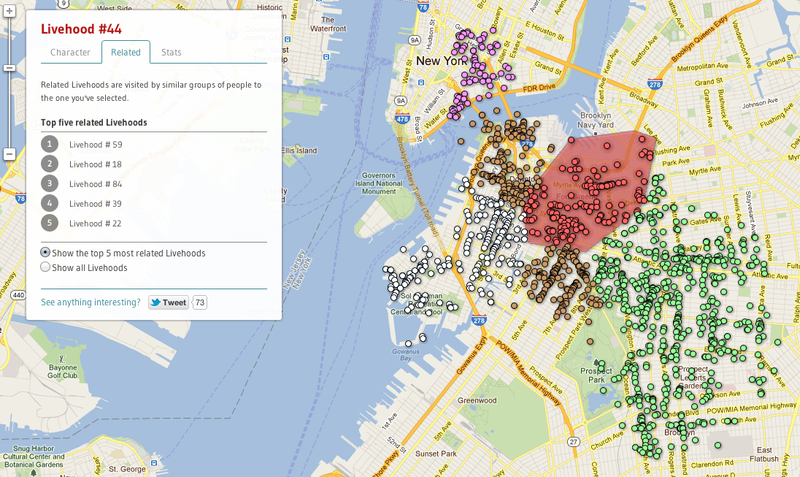 The central hypothesis of the project is that the character of an urban area is defined “not just by the the types of places found there, but also by the people who make the area part of their daily routine” and to this end, the researchers have prototyped social maps of New York City, San Francisco and Pittsburgh. Drawing on the analysis of check-in data, these maps propose new spatial clusters, ‘livehoods’ as a means for representing the use-patterns of various regions of the city. This aggregation and analysis yields funky polygonal zones whose geometry is tied to social practice rather than an orthogonal street grid or municipal incorporation. On focusing the map interface one of these social constellations, a user can scan popular venues, dial up an analytics view of daily and weekly ‘pulse’ of activity and also access a bar graph comparing the types of venues people are frequenting. The most interesting option within the interface is the ‘related’ view, whereby the majority of the map content disappears leaving the selected livehood and the top five livehoods that the same user base frequents – these are often adjacent, but sometimes across town. Thus far the developers have not revealed too much about their methodology but they’ll be presenting a paper, ”The Livehoods Project: Utilizing Social Media to Understand the Dynamics of a City” at The 6th International AAAI Conference on Weblogs and Social Media in Dublin this June. 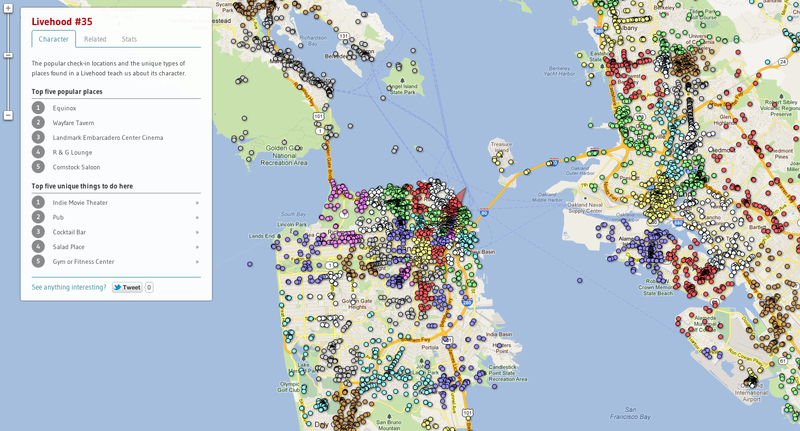 Hopefully we’ll see maps rolled out for more cities soon.